Now, this is what I call a true crusader. Definitely would’ve liked to partake in a conversation with Ms. Carson…actually, an interview of some kind would’ve been amazing…. so that I could ask about her background and knowledge with regard to the umbrella of topics under what is: ‘environmental conservation‘. In the 50s and 60s, she seemed to be quite the revolutionary–discussing what were the environmental problems that she believed agrochemicals caused… quite a unique thought to have at that time. She is such the inspiration. 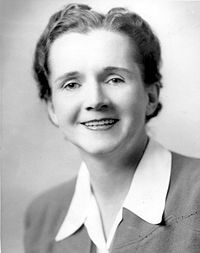 After reading this article, I actively began clicking away on Amazon.com, searching for what will be my first purchase of one of her books…and the pick — Silent Spring ! I will keep you posted on my read! Cheers!